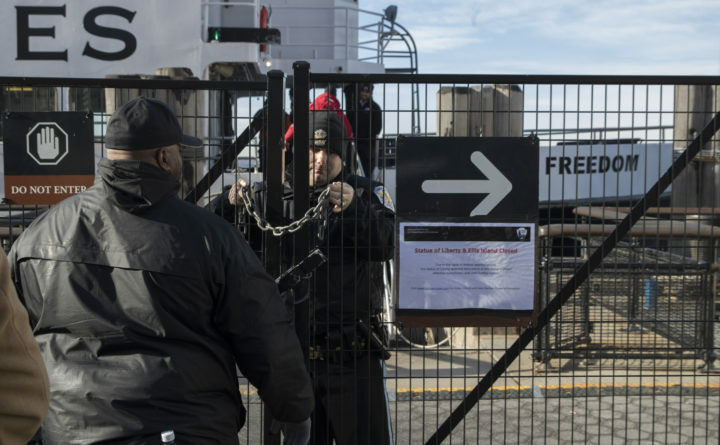 A United States Park Police officer, center, locks a gate leading to a Statue of Liberty ferry, Saturday, Jan. 20, 2018, in New York. The National Park Service announced that the Statue of Liberty and Ellis Island would be closed Saturday "due to a lapse in appropriations." Late Friday, the Senate failed to approve legislation to keep the government from shutting down after the midnight deadline. The snowy mountains and frozen lakes of Rocky Mountain National Park are still accessible to visitors, despite the federal government shutdown. But across the country in New York, the nation’s most famous monuments to immigration — the Statue of Liberty and Ellis Island — were closed Saturday. The National Park Service oversees natural wonders and historic landmarks across the nation. The park service’s parent agency, the Interior Department, had vowed to keep as many parks and public lands open as possible during the shutdown, which began at midnight Friday on the East Coast. But by mid-day Saturday, the pattern was spotty. The USS Constitution, the 220-year-old warship anchored at Charlestown Navy Yard in Boston, was open, but Boston’s Bunker Hill Monument was closed.